Hear ye, hear ye! You don’t have to cross the pond to see a fairytale castle! Medieval castles, Victorian palaces, and stone masterpieces dot the U.S., many of them offering immersive tours, afternoon tea, and even overnight stays. Here, eleven fairytale castles that are closer than you think. William Randolph Hearst, a businessman and newspaper publisher, began constructing Hearst Castle in 1919 when he inherited the land (and eventually purchased more). Along with his architect, Julia Morgan, the castle estate encompassed 165 rooms and 127 acres of gardens, terraces, pools and walkways by 1947. However, Hearst never saw the competition of his castle before his death in 1951. 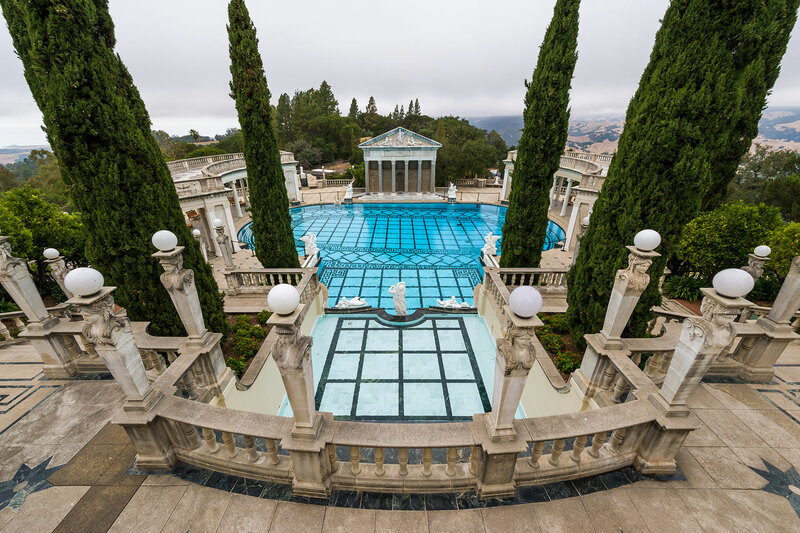 Hearst Castle, now a National Historic Landmark, opened to visitors in 1958. Families can enjoy a variety of tours in different parts of the castle, located about an hour north of Pismo Beach. It is recommended that visitors reserve their tour tickets online at least 60 days in advance due to high demand. Families can tour the Grand Rooms, which include the Billiard Room and Theater among others, the Cottages and Kitchens or the Upstairs Suites. There are numerous tours to choose from and most are about one hour long. Fonthill Castle, about an hour outside of Philadelphia in Bucks County, was the home of Henry Chapman Mercer, an archaeologist and anthropologist (among other professions). Mercer is said to have built the castle (between 1908 and 1912) in order to showcase his intricate Moravian tiles. Today, families can go on guide-led tours of the castle, where they’ll learn the history of each room. Be on the lookout for Rollo’s Stairs — Mercer had the stairs built for one of his beloved dogs. Afterward, visit the Mercer Museum to learn how the Moravian tiles are made and even purchase some to take home! Fonthill Castle offers special Tower Tours for families (available on select dates), as well as themed scavenger hunts for kids. Located in New York’s Finger Lakes region, Belhurst Castle was built in the 1800s. Belhurst, which means “beautiful forest,” was used as a home, restaurant, casino, and speakeasy before becoming a luxury hotel in the 1970s. The stone mansion is listed on the National Register of Historic Places and welcomes guests to stay in a variety of accommodation options. Belhurst features two restaurants (with a kids’ menu and weekend brunch) and a spa, all overlooking Seneca Lake. Situated in Colorado Springs (about 1.5 hours outside of Denver) is Glen Eyrie Castle. Families can enjoy a guided tour of this castle and hear the stories of railroad wars and oil tycoons. The 90-minute tour takes visitors through the Carriage House and the first and second floors of the castle. Every year, there is a Christmas Castle Tour, as well, and for one day, the entire castle is open for viewing. Families can visit each castle room on all four floors. Tea is also served in the Castle Music Room on select dates. Bring your favorite fascinator! Reservations for a tour or tea are required and the Christmas Castle Tour sells out well in advance. Located in Asheville, North Carolina, among the gorgeous Blue Ridge Mountains, the Biltmore Estate has been a part of the Vanderbilt family since the 1800s. George Vanderbilt officially opened his home (with 35 bedrooms, 43 bathrooms and 65 fireplaces) on Christmas Eve, 1895. 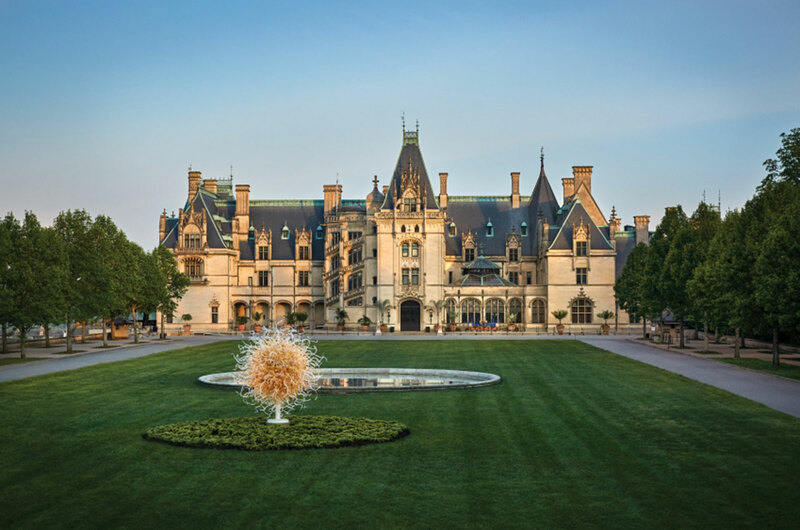 The 90-minute to two-hour tours at the Biltmore House are self-guided and offer a look at the architecture, artwork, vintage clothing, furniture and more inside the grand rooms. There is even a kids’ audio guided tour that is narrated by Cedric, the Vanderbilts’ Saint Bernard. 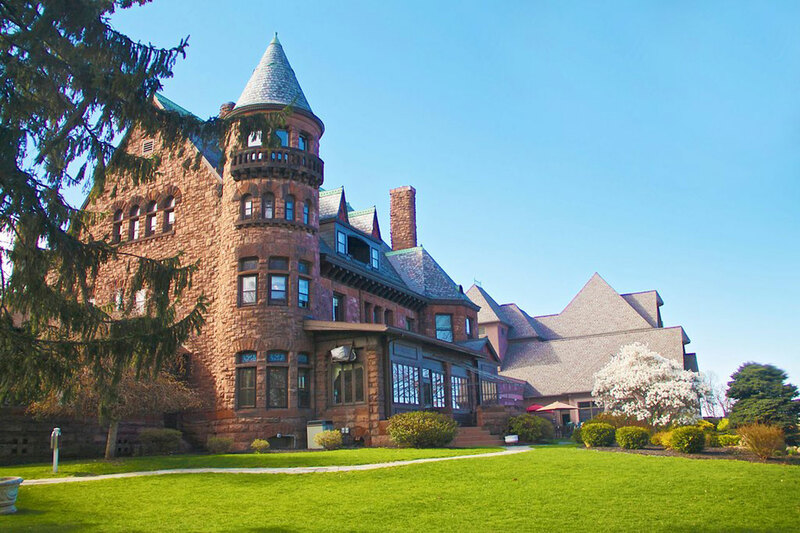 Kids will love hearing the stories of this castle and the Vanderbilt family while checking out the indoor pool and bowling alley, too! A bonus for parents: tour admission includes a visit to Antler Hill Village and Winery for a complimentary wine tasting. Boldt Castle, located in New York’s Thousand Islands, is only accessible by water and open to visitors between mid-May and mid-October. Millionaire hotelier, George Boldt, began construction of the castle on Heart Island for his wife, Louise, in 1900. It was to be their summer home. However, Louise died in 1904, just months before the castle was completed. All construction was stopped on the castle immediately, and George never returned to Heart Island. The property was acquired by the Thousand Islands Bridge Authority in 1977, restored and opened to the public. There are several tour boat companies from Canada and New York that operate tours to Heart Island and Boldt Castle. Families can tour the ballroom, billiard room, bedrooms and more inside the castle, as well as several of the other castle buildings on the island. Kids will love to visit on the annual Family Fun Day, which usually takes place in June. There are arts and crafts, face painting, tours of the castle and special character appearances for the kids. Admission is free for children under age 4. 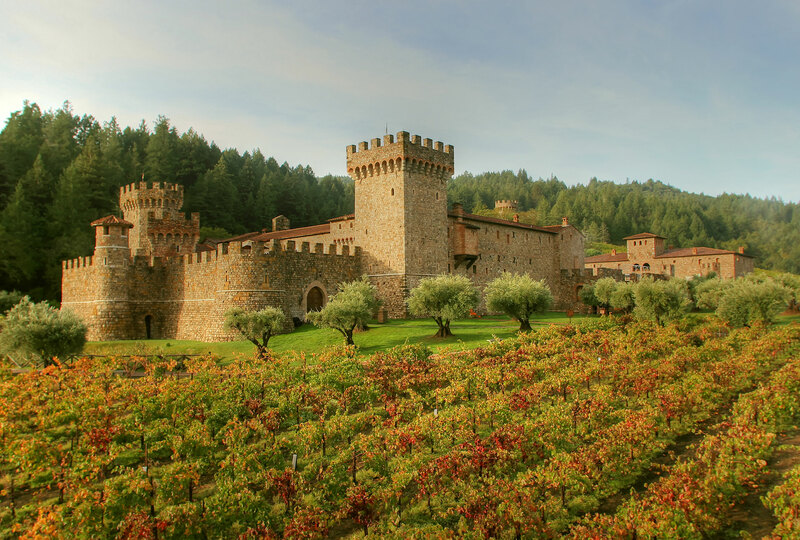 This authentically-built castle and winery in Napa Valley is inspired by medieval 13th century Tuscany. Construction of the underground cave and wine cellars began in 1994 and expanded from an original 8,500 square feet to 121,000 square feet and 107-room castle. The modern-day constructed but authentic, medieval castle includes a dry moat, five towers, courtyards, a Great Hall, secret passageways, a prison and torture chamber and much more. Castello di Amorosa is considered authentic because its construction methods and materials date back hundreds of years. Stone was chiseled by hand to build this castle that was completed and opened to the public in 2007. The castle, which is also a winery, offers tours and wine tastings throughout the year. The castle and tours are kid-friendly, too! 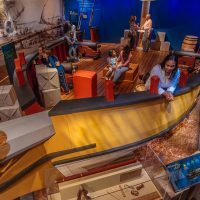 Children over the age of 5 are welcome to enjoy the guided, walking tours with parents, and their ticket includes a cup of juice during the wine tasting portion. There is also a kids’ table in the tasting room, where coloring books are offered to children. Keep in mind the tour is about an hour long and the wine tasting is another 45 minutes. This National Historic Landmark in Galveston, Texas, was built between 1887 and 1892 for Colonel Walter Gresham, an attorney and entrepreneur. Once called the Gresham House, the home is called Bishop’s Palace because in the 1920’s, it was home to the bishop of the Galveston-Houston Archdiocese. The first-floor rooms in this Victorian house (or castle, some may say) have 14-foot, coffered ceilings, and there is a 40-foot tall, octagonal mahogany stairwell that features stained glass on five sides. To say this home is a palace is an understatement. Families can take a self-guided audio tour of the palace or on select dates, an exclusive Basement to Attic tour is available. Not to be outdone by his younger brother, George, Cornelius Vanderbilt II constructed The Breakers between 1893 and 1895 (the Biltmore also opened in 1895). 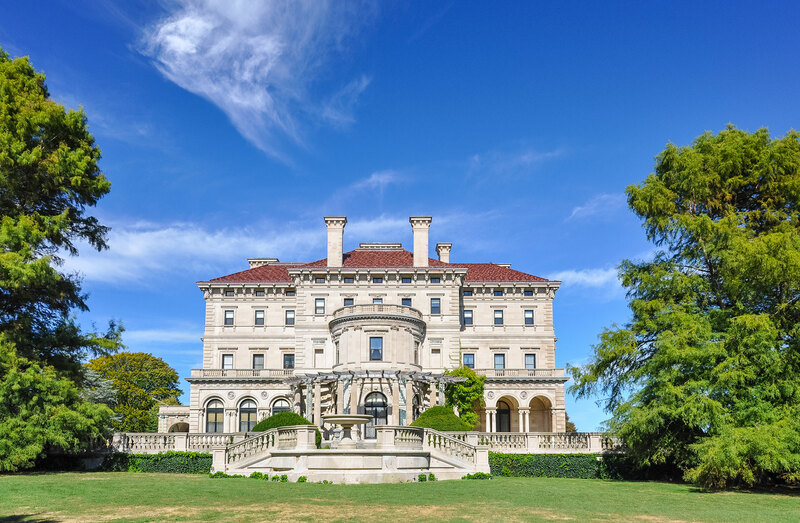 The Breakers was built as a summer home in Newport, Rhode Island, and remained in the Vanderbilt family until it was leased to The Preservation Society of Newport County in 1948 and then sold to the society in 1972. But it was sold with the understanding that Cornelius Vanderbilt’s granddaughter, Countess Sylvia Szapary, who last inherited the property, would have life tenancy of The Breakers. However, following Sylia’s death in 1998, the society agreed to allow the family to continue to live on the third floor of the mansion, which is not open to the public. Today, this American castle is a big draw for tourists who can chose from a variety of tours. Families can enjoy a self-guided audio tour or a guided tour of several buildings or houses on the estate. There are even tours of the underground infrastructure of the mansion or a behind-the-scenes look at servant life at The Breakers. The tours are conducted year-round; however, some of the houses or buildings on the estate are closed seasonally, so be sure to check which structures are open during your visit. Young children may find these tours a bit boring, but if you visit in December, Santa makes an appearance on select Sunday afternoons! Located about 30 minutes outside of Cincinnati, Loveland Castle (also known as Chateau Laroche) was constructed in the 1920’s by Harry Andrews, a boy scout troop leader and World War I veteran. Andrews named the castle after a military hospital in France, where he was stationed as a medic in WWI. When Andrews died in 1981, he willed the castle to his boy scout troop, who extensively upgraded and renovated it. Today, families can take a self-guided tour of Loveland Castle between April and September. Groups can also do overnight stays at the castle, which includes a full tour with a knight. Handmade games and puzzles that Andrews created himself are available for kids to enjoy today. There’s also a fire pit outside. Be on the lookout for ghosts, too — Loveland is said to have a few. 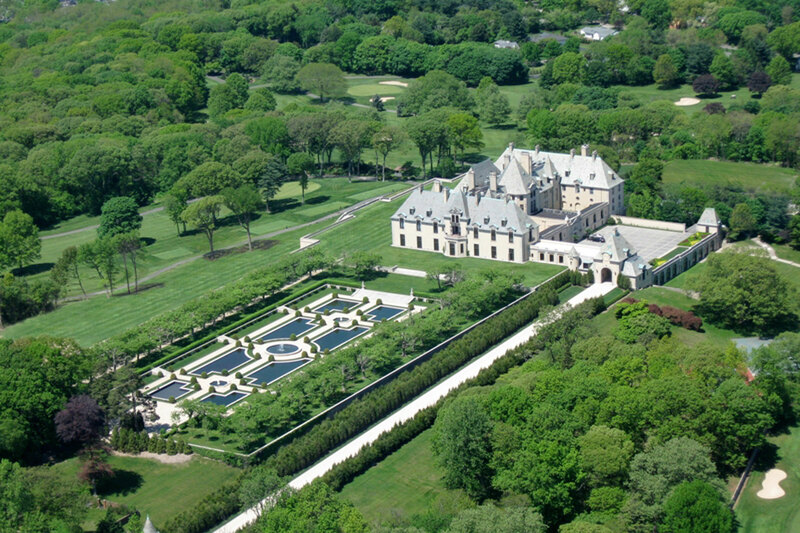 This Long Island castle was commissioned in 1919 by Otto Hermann Kahn, a financier who wanted to host lavish parties. Sound familiar? It served as one of the inspirations for F. Scott Fitzgerald’s “The Great Gatsby.” (It has also appeared in several movies and TV shows.) Today, families can stay in one of the 32 luxury castle guestrooms or take a tour of the estate. The once-daily, hour-long guided tour showcases Oheka Castle’s public areas and gardens and ends with coffee, tea and homemade cookies.